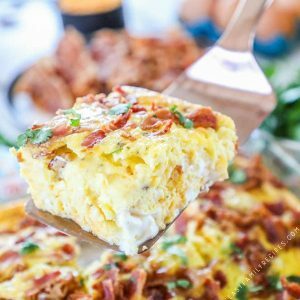 This Breakfast Casserole with Bacon is a classic baked egg casserole loaded with savory rich flavors. The baked eggs are rich and creamy and topped with perfectly crisp bacon and cheddar cheese for the ideal easy breakfast! This breakfast casserole comes together quickly with just a few simple ingredients and can be reheated for breakfast on the go throughout the week. You can also make it ahead and bake it the next day for when you need it early in the morning. 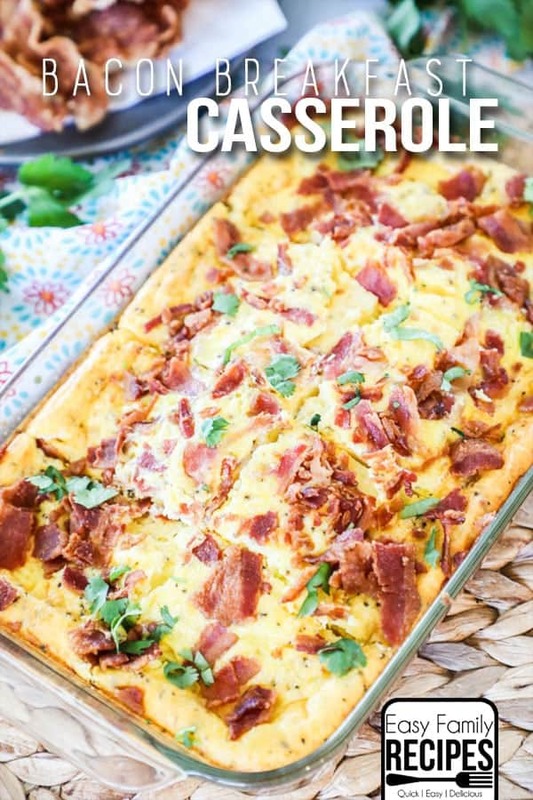 Not only is this casserole a simple and super delicious breakfast, but it is also gluten free and low carb so it is perfect for serving a crowd. We are most definitely breakfast people. We all love breakfast food and whether it is breakfast for breakfast or breakfast for dinner, we do eat it frequently around here! Whether it is sweet like these apple cinnamon muffins or our popular Apple Fritter Casserole, or savory like today’s recipe we love them all! Breakfast Casserole is a staple around here. This classic sausage Breakfast Casserole is one of the most popular recipes on my site, and this Hashbrown Breakfast Casserole is loaded with veggies and a personal favorite, but my daughter especially loves bacon so I made this casserole recipe for her and boy does she love it! I love this Breakfast Casserole with Bacon because it is quick, simple, and loaded with rich and delicious breakfast flavors. This is a pretty basic egg bake, but adds chunks of cream cheese that make the casserole extra creamy and extra delicious! 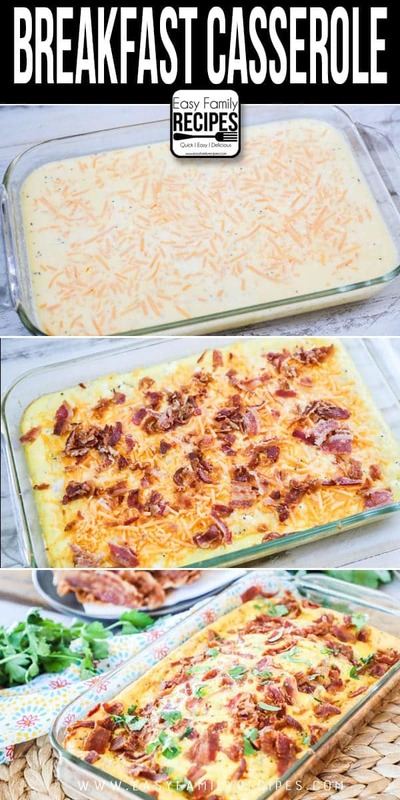 The method we use to bake the casserole helps the bacon to stay crispy and all together we think this is the ultimate bacon breakfast casserole! This is a really simple recipe with just a few simple ingredients. I am going to walk through some tips and tricks for you here to hopefully answer any more specific questions that may come up while cooking, as well as giving tips for making it the night before and storing leftovers. 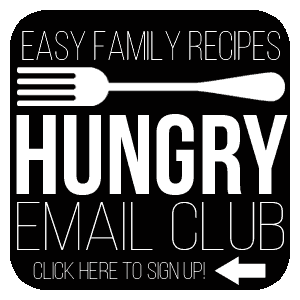 There is a FULL printable recipe card at the bottom of this post. 12 extra large eggs– I use extra large eggs. If you have a smaller size you can add an egg or two to make up for the difference in size. 1 cup heavy cream- I recommend using heavy cream to give it the richness and texture we love. You can substitute half and half or milk if you want to lighten it up a little bit but it will change the taste a little. 1/2 lb bacon, cooked crispy and crumbled- This is about 1/2 a regular sized package. I like to batch cook my bacon in the oven then use what I need and freeze the rest. You can also do smaller batches of bacon cooked in the microwave really quickly with a great crispy result. 4 oz cream cheese, cubed- I use original Philadelphia Cream Cheese, you can also use light cream cheese or neufchâtel cheese. I make the cubes about 1/2 inch thick so they turn out as small bites. 1 cup sharp cheddar cheese, shredded- I prefer sharp cheddar for this because you can get the most flavor without making it an overload on cheese. If you don’t have sharp cheddar you can use medium or mild, or a mexican cheese blend. In a large bowl, mix the eggs, heavy cream, 1/2 cup cheddar, salt and pepper together. I whisk the eggs, cream, salt and pepper first so they get well beaten then I stir in the cheese. After it is mixed, pour the egg mixture in a greased 9×13″ casserole dish. Drop the cubes of cream cheese evenly throughout the egg mixture. These will stay in cubes in the casserole so I like to make them small enough so they aren’t overwhelming but big enough so that you can find them in the casserole and they don’t just disappear. Bake for 35 minutes, then sprinkle the remaining cheddar cheese and bacon over the top of the casserole and then return to finish baking 10-20 minutes or until the center is just set and springs back when touched. This step is key to keeping the bacon crispy. By adding it just at the end, it stays on top of the casserole and is cooked without being coated with egg which allows it to stay crispy. If you prefer your bacon not to be crispy, you can mix the bacon in with the egg mixture at the beginning. I would still add the remaining cheddar in the end though so it coats the top which will allow the flavor to shine through more. If you want to make this breakfast casserole the night before, you can with great results! This is perfect for when you need the casserole for a holiday or an early morning brunch or pot luck. Follow the recipe through step 3, then refrigerate the casserole until you are ready to bake. When you are ready to bake you can pop the casserole in the oven and add an additional 10-15 minutes to the time to compensate for starting from the colder temperature. Continue with the recipe at step 4 and enjoy! This casserole is so good there is a good chance there won’t be a crumb left, but just in case there is, here is what you can do with the leftovers. You can store this casserole both in the refrigerator or the freezer after baking. It reheats well from either and can also be baked and used for breakfast meal prep so that you can have a hot breakfast on the go easily. Store leftovers in an airtight container, I use a ziplock bag often, and place in the refrigerator for 3-4 days or in the freezer for up to a month. To reheat, remove a slice and microwave until hot. I really hope that your family enjoys the Breakfast Casserole with Bacon as much as we do! If you have a bacon lover in your life, it is the perfect thing to try! This Breakfast Casserole with Bacon is a classic baked egg casserole loaded with savory rich flavors. It is rich and creamy and is topped with perfectly crisp bacon and cheddar cheese for the perfect easy breakfast! It comes together with just a few simple ingredients and can be reheated for breakfast on the go throughout the week. In a large bowl, mix the eggs, heavy cream, 1/2 cup cheddar, salt and pepper together. Then pour the mixture in a greased 9x13" casserole dish. Drop the cubes of cream cheese evenly throughout the egg mixture. Easy to make and delicious! The family loved it. I only had half and half (instead of heavy cream) and it came out great!!! This is my favorite breakfast casserole!! It was very good I’m making it again today!